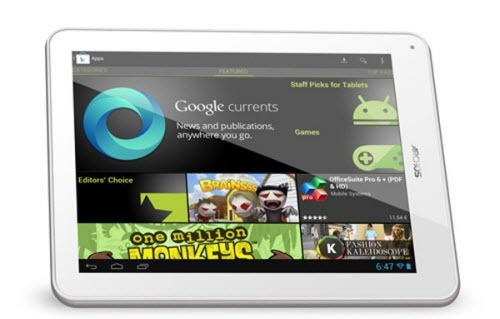 Archos again launched a new android tablet. It is named as Archos 97 Titanium HD. It has got a Super HD Display on the 9.7 inch screen size. Further it has the resolution of 2048 x 1536 pixel that brings the pixel density to 264 PPI. It has IPS capacitive touchscreen with the 10 point touch sensitivity. It has got a dual core A9 chipset with the speeds of 1.6 Ghz and along with that, there is quad-core GPU Mali 400 MP4 chipset. Most of the tablets released from the Archos has Android 4.0 ICS only but this is the first time Archos comes with Android 4.1 Jelly Bean Operating System. It has 1GB of RAM and 8 GB of internal memory. The internal memory can be extended by 64GB more if you use a MicroSD card externally. The tablet is capable to play the videos and content at 1080p quality with the frame rate of 30 fps. One of the best part of Archos 97 Titanium HD is it comes with many pre-installed app especially Google apps such as Google Maps, Gtalk, GMail, Search, Google Currents, Google Drive with cloud storage with 5GB of free capacity. Obviously Google Play Store is also available to download the best apps for your needs. Additionally, it also comes with another pre installed app called Office Suite Viewer it is especially useful for business purposes. This would help to view all the Microsoft Office based documents. Another interesting feature of this tablet is it has the HD quality that would produce sharper and better images and videos. It has 9mm thickness and it weighs 640gm. This tablet has dual cameras, the rear camera being a 5 megapixel one with autofocus, while the front camera has 2 megapixel lens in it. Archos doesn’t reveal anything about its battery capacity, actual price and its availability. It is a Li-ion battery rechargeable through either the computer port, or the external charger. The Archos 97 Titanium HD tablet is shaped and colored like the Apple iPad. It looks plastic, but the actual casing is all made of Aluminium and this would be the strength.